Our Favorite Picture Books About LOVE! Looking for awesome picture books about love? Here you go! It's almost Valentine's Day! Can I be honest with you guys for a minute? If I told you I’m head over heels in love with February 14th, I’d totally be lying. Flashback to 1994, and you would see a lanky girl with frizzy hair, a mouth full of braces and an elephant-sized backpack weighing her shoulders down to the ground as she walked the halls of a Miami high school. Um, that would be me. I always looked on — partly with awe, partly with envy — while the so-called “pretty” girls pranced around like human floral shops, their pink and red heart balloons bopping in the air atop bouquets of roses and carnations. And so it was that I began to rebel against the day, wearing black every Valentine’s day thereafter, telling all who would listen that it was absurd to have a holiday forcing us to say I love you, when it really should be said to those we care about all the time. Angst, anyone?! Ok, ok. Before you exit out of this blog post, I get it. I’m a mom now, and yes, it’s fun to shower my kids with love and special treats on Valentine’s Day. But, more importantly, whether you love it or whether you rebel against it like I used to, Valentine’s Day does present us with perfect opportunity to talk to our kids about the ways in which we express affection and show others we care. What is love, anyway? What does it mean to love someone or something? How should love make us feel? These are big questions, and they don’t always have the easiest answers. After all, sometimes love makes us feel like the sun is shining only for us, but other times, that love can be so overwhelming (or unrequited) that it brings us to tears. It is no wonder that children have such a hard time understanding what is going on in their little heads when one single emotion can affect us in such profoundly different ways. So how do I celebrate Valentine’s Day with my boys now? As our worlds turn various shades of posy pink and radiant red, we like to celebrate by sharing some heart-filled books with messages that actually transcend Valentine’s Day. Any book that honors love in its purest form are fair game, books we can read, enjoy and contemplate all year round. This February 14th, you’ll no doubt find us snuggled together on the couch and reading fun and quirky stories about it means to love and be loved. Here are some of our favorite books -- the huggy kind, the kissy kind, the self-love kind, and -- my personal favorite -- the love is love is love kind. Enjoy! Love, Z, by Jessie Sima: We adore this new release about a robot who is trying to understand a message he finds in a bottle. “Love, Beatrice,” the message says. But what is love? And who is Beatrice? As the robot journeys to find the answers to his questions, he discovers that love actually surrounds him all the time — he just never knew the right word to explain how he felt. Children will simply adore the idea that sometimes love is hard to explain, but we know it when we feel it. So in LOVE with this one! Loved to Bits, by Teresa Heapy and Katie Cleminson: Do your children have a stuffie that goes on adventures with them every day? Is that stuffie chewed and tattered and torn, but still your kiddo’s most prized possession? This is a whimsical and tender story about a boy and his beloved bear, Stripy Ted, who weather all kinds of journeys together. And when Stripy Ted loses a leg, or an eye, or yet his other leg - the boy still thinks he’s just right. A beautiful ode to your child’s favorite toy! Robot in Love, by T.L. Mc. Beth: Robot’s smitten. He has fallen in love with someone special. Someone shiny and special. And he will stop at nothing to win her attention. But can he keep his circuits from overheating and find the courage to tell her how he feels? This one has a twist ending you won’t see coming, and we laughed about it for days! Worm Loves Worm, by J.J. Austrian, illustrated by Mike Curato: What happens when two worms fall in love and want to get married? Which worm will wear the dress and which will wear the tuxedo? On second thought, if worm loves worm -- why should anything else matter? This fabulous story is without a doubt Happily Ever Elephants' favorite book about love. For our full review of Worm Loves Worm, click here! This is not a Valentine, by Carter Higgins and illustrated by Lucy Ruth Cummins: This is a tender story of a little boy navigating his first crush. It’s not about the trite things kids (or adults, for that matter!) think they should give someone to show their love- but instead those precious, unique things children do that, when viewed through a little one's eyes, become magical and meaningful. This heartfelt book is so accessible to children, illustrating that love is composed of those tiny actions we take to show someone we care about how much they brighten our world. For our full review of This is Not a Valentine, click here! Love Is, by Diane Adams, illustrated by Claire Keane: A little girl learns what it means to love as she cares for her new pet. Her duckling requires a lot as he grows, needing constant attention from the girl. She hugs him closely and cares for him with everything she has… but eventually, it is time to let go. This is a tender beauty for any child caring for a pet - and for those who need a gentle reminder that sometimes, when we love something, we have to set it free. Loving Hands, by Tony Johnson and illustrated by Amy June Bates: If you are a parent or a guardian, I dare you to read this without crying! In this beautiful ode to the love shared between a mother and her son, readers see how the tiniest of life’s moments are always grounded in love and reassurance. Though the boy continually reaches for his mother’s hand as he grows, time eventually passes and he becomes the one offering affection and support to his mother. A tender, gentle beauty. 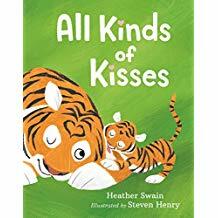 All Kinds of Kisses, by Heather Swain, illustrated by Steven Henry: How do giraffes kiss? What about hummingbirds? If your little ones love hitting you up for smooches, they will love reading this book with you -- and trying to imitate the animals' actions. This is always a winner in our house, ending up with my boys rolling on the floor in fits of giggles as they try to mimic all of the animal kisses. I Love You, Stinky Face, by Lisa McCourt and illustrated by Cyd Moore: “Mommy, mommy, will you still love me if….” YES! Yes, I’ll still love you if… Have you heard these questions before? Then this book is a must. It’s silly, it’s wacky, but it drives home a very important point: a parent’s love is constant and unwavering, no matter the situation, no matter the stink! This one is a blast - an oldie but goodie! Love, by Matt De La Pena and Loren Long: This is a meditation on love- that transcendent, all encompassing, powerful emotion so integral to who we are as humans, an emotion so easy to feel but so difficult to adequately express in words. The prose is poetry in its purest form, the message is timeless, and the notion that love can be found in both the familiar and the unexpected is masterful. The stunning illustrations will be mirrors for kids worldwide. For our full review of Love, click here! Did you like this post? We are so glad! Guess what else we LOVE? Snuggling up and reading incredible books with our little ones. Check out these awesome lists for more books we love!